This illustration shows HD 189733b, a huge gas giant that orbits very close to its host star HD 189733. The planet's atmosphere is scorching with a temperature of over 1000 degrees Celsius, and it rains glass, sideways, in howling 7000 kilometer-per-hour winds. Image released July 11, 2013. Call it the deep blue dot. For the first time, scientists have seen the visible color of a distant alien world. The exoplanet — called HD 189733b — is 63 light-years from Earth and a "deep cobalt blue," with raging storms of glass rain and super-fast winds, scientists say. 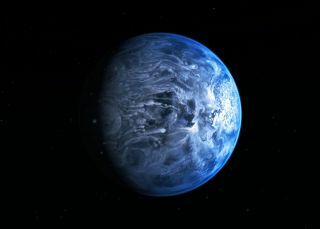 The alien planet's blue color was pinned down using observations from the Hubble Space Telescope. Although the planet might be the same color as Earth from space, scientists think that HD 189733b is a "hot Jupiter" — a gas giant planet that orbits very close to its star. It takes 2.2 Earth days for the planet to travel fully around its sun. This illustration shows a "hot Jupiter" planet known as HD 189733b orbiting its star, HD 189733. The NASA/ESA Hubble Space Telescope measured the actual visible light color of the planet, which is deep blue. Image released July 11, 2013. The exoplanet's weather is less than ideal. Its atmosphere is more than 1,832 degrees Fahrenheit (1,000 degrees Celsius) and the planet rains glass sideways in 4,350 mile per hour (7,000 km/h) winds, according to Hubble officials. In 2007, NASA's Spitzer Space Telescope helped scientists map the weather conditions of the strange alien planet when the spacecraft produced one of the first temperature maps of an exoplanet. The data revealed that temperatures on the day and night sides of the world differ by about 500 degrees Fahrenheit (260 degrees Celsius), causing the strong winds to blow. Scientists aren't sure what causes the blue planet's coloration, however. "It's difficult to know exactly what causes the color of a planet's atmosphere, even for planets in the solar system," Pont said. "But these new observations add another piece to the puzzle over the nature and atmosphere of HD 189733b. We are slowly painting a more complete picture of this exotic planet." The research team uncovered the planet's color by measuring the light reflected off the surface of the planet. "We saw the brightness of the whole system drop in the blue part of the spectrum when the planet passed behind its star," Tom Evans of the University of Oxford, U.K., the leader of the study being published in the Aug. 1 issue of the journal Astrophysical Journal Letters said in a statement. "From this, we can gather that the planet is blue, because the signal remained constant at the other colors we measured."